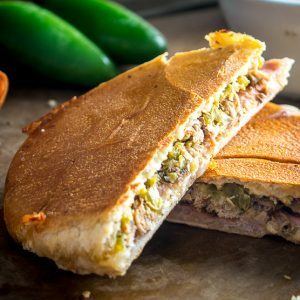 Similar to the difficulties you’ll have finding a Cuban sandwich anywhere in Cuba, you’ll be hard-pressed to find this Mexican Cuban Sandwich while traveling through Mexico. 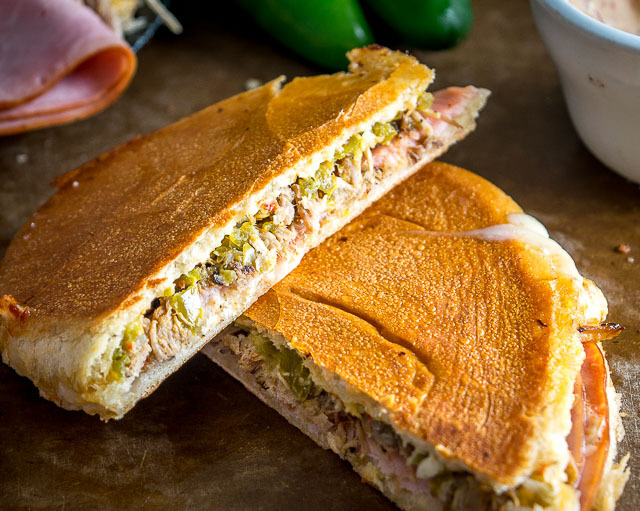 A classic Cuban sandwich uses pickles and mustard to make the pork and ham crackle with vibrancy. 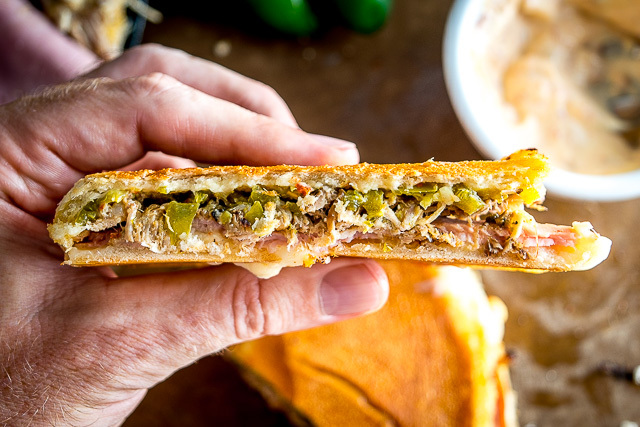 We’re using pickled jalapenos and chipotle mayo with similar effect, and after getting the ratios right this version rivals and maybe even surpasses the original Cubano. Do you already have some roast pork or pulled pork available? We’ve got a delicious batch of slow cooked carnitas in the fridge ready to spring to life. This is citrus-infused pork shoulder that’s already been slow-cooked for a few hours. The slow cooker makes it so easy to bring authentic carnitas to your home so it’s worth considering a batch if you’ve never tried it before. (Details on making it here). Using a 2 lb. chunk of pork also happens to make a huge batch of carnitas that will leave you plenty of leftovers for things like Mexican Cubanos. 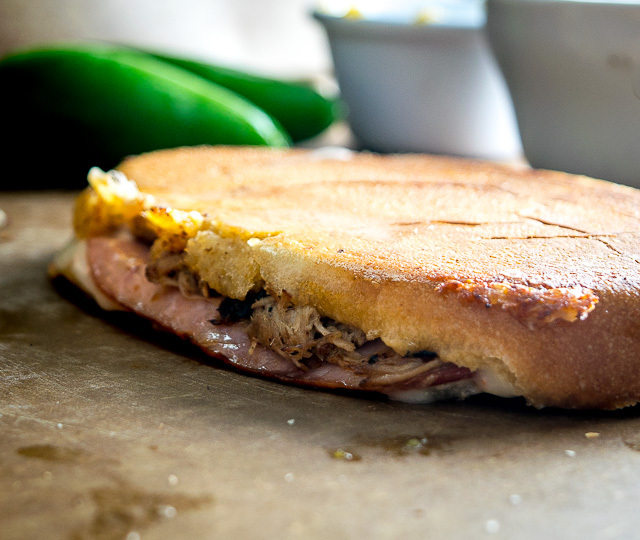 And while the carnitas are the centerpiece of the sandwich, it’s the acidity that gives it that familiar Cubano flavor. 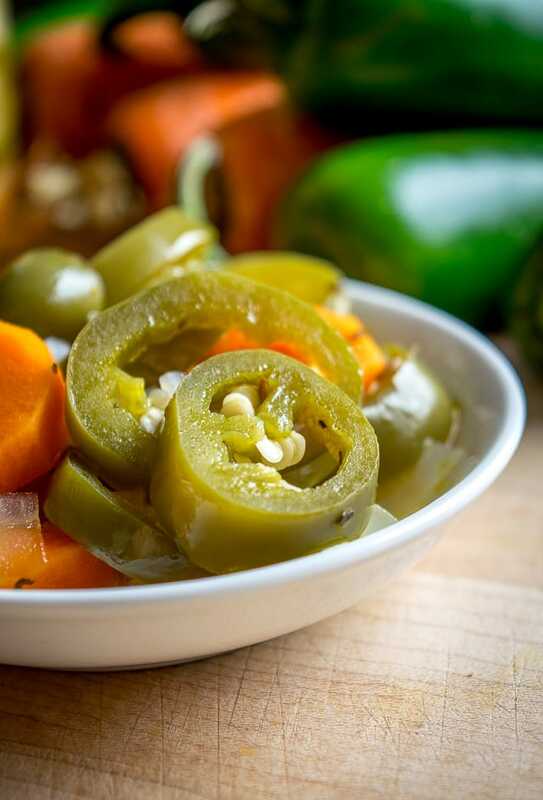 We’re using some of these home pickled jalapenos to add both acidity and heat. But you don’t need to make a homemade batch as storebought pickled jalapenos will work well too. We’re also whipping up a vibrant chipotle mayo for these sandwiches. While traditional Cubanos are made with Cuban bread, you can use nearly any sandwich roll or baguette and get equally good results. 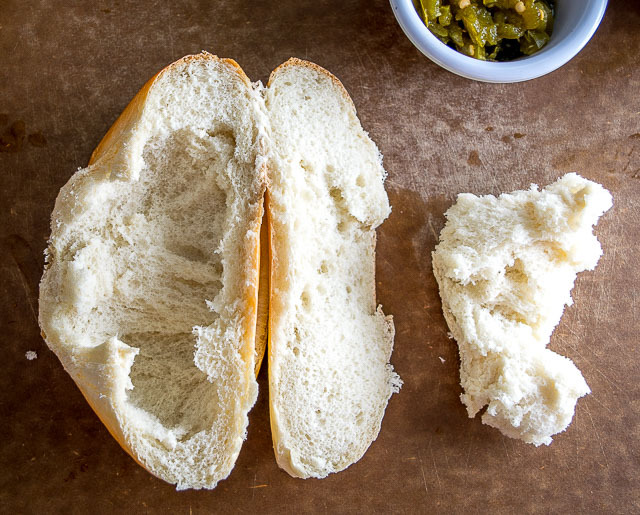 If using a common sandwich roll, like we are here, then tearing out some of the bread will keep the meat-to-bread ratio within the Mexican Cubano standards. If you’re pulling pork or carnitas straight from the fridge it’s worth warming them up before building the sandwiches. You’ll need at least 1/2 cup per sandwich so as pictured this is a heaping cup of carnitas cooking in oil over medium heat until slightly crispy on the bottom; this will be enough for two loaded Cubano Mexicanos. You can drop the ham slices on top of the carnitas for the last couple minutes if you want to heat those up too. Then it’s just a matter of building your masterpiece with a healthy layer of chipotle mayo, diced up pickled jalapenos, cheese, carnitas, and ham. Cuban sandwiches are traditionally served up flat as a board to mimic the flatlands of Florida and provide counterpoint to the mountainous Cuban homeland. Okay, sorry, I made that up. I guess the really reason Cuban sandwiches are traditionally served squished is to make sure the cheese melts. If you have a panini press to accomplish this then whip it out. If not, you can use just about anything to press down on your Mexican Cuban delight. 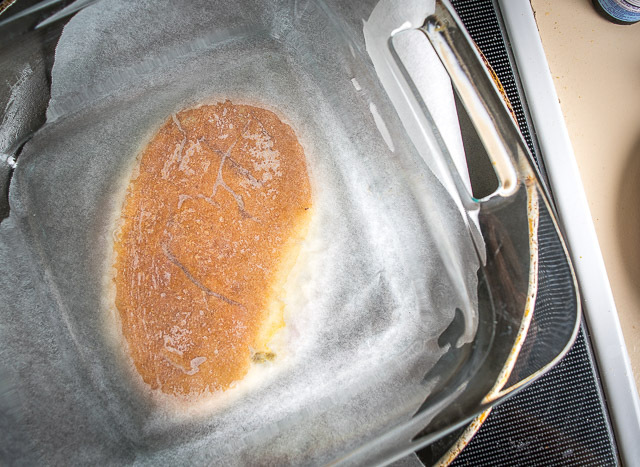 You can also use a thin layer of butter in the skillet to crisp up the edges of the sandwich (or lard!). I’ve had the best success cooking them in a skillet on slightly-less-than-medium heat for about 3-4 minutes per side, while pressing down on them for the first minute or so. If all went according to plan you’ve got a squished Mexican Cuban Sandwich with flavor bursting out of it. Serve immediately as these are best when they are piping hot and crispy. Keep the chipotle mayo close by as applying a bit more to each bite is rarely discouraged. And note that you need a healthy layer of pickled jalapenos to compete with the rich flavor of the pork. If you find your first bite lacking in pickled vibrancy then open it up and add some more. And who knows, eventually you might find yourself making carnitas just so you can have some Mexican Cubanos for lunch. A delicious update on the classic Cuban Sandwich. We are using pickled jalapenos and chipotle mayo in place of the pickles and mustard. Works great with leftover carnitas! 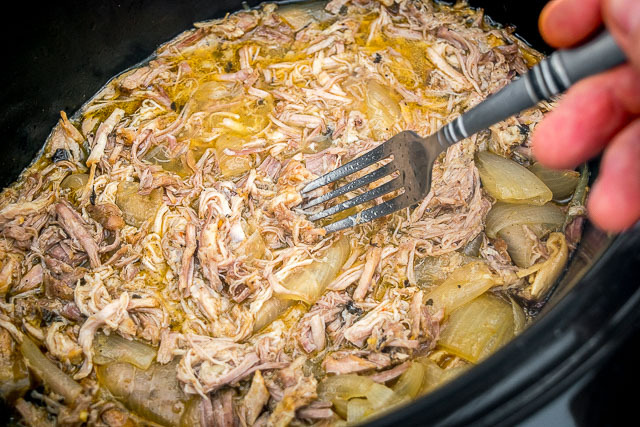 (This recipe is using cooked carnitas from this slow cooker carnitas recipe but you can use any roast or pulled pork that is already cooked). 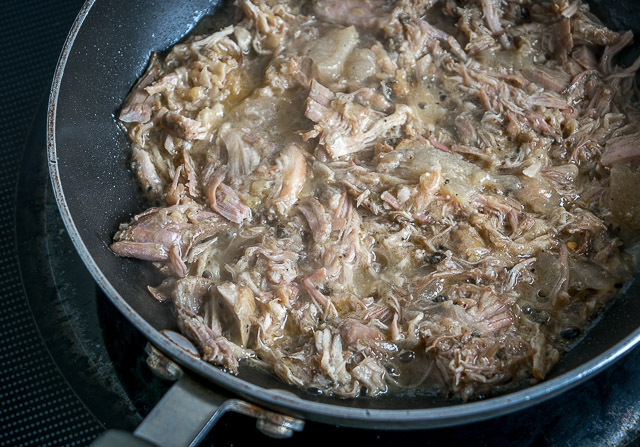 If you are warming up the carnitas, heat up a dollop of oil in a skillet over medium heat. Add a heaping cup of carnitas and cook until the underside is crisping up, approximately 5-7 minutes. You can add the ham slices to the pan for the last couple minutes of cooking if you want. 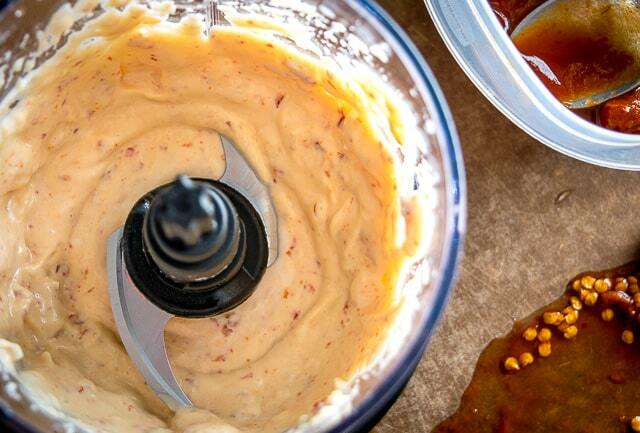 For the Chipotle Mayo, combine the listed ingredients in a blender or food processor. Taste for heat level and seasoning. 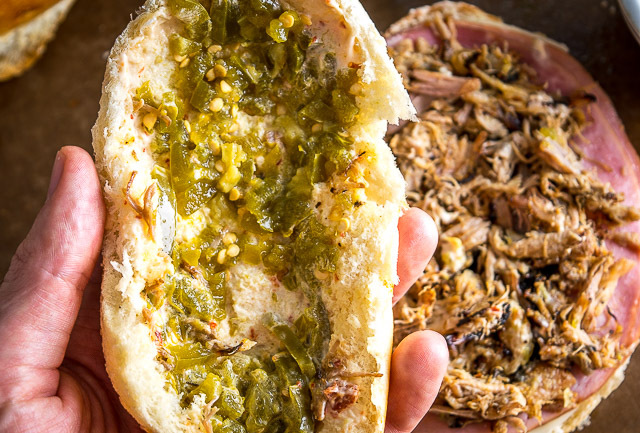 Each sandwich gets a layer of chipotle mayo, diced pickled jalapenos, cheese, pork or carnitas, and 2 ham slices. Cook the sandwiches in a skillet over medium-low heat for 3-4 minutes per side. Press down on the sandwiches with a casserole dish or pan to compress them. You can also add a thin layer of butter to the skillet if you want to crisp up the edges of the sandwich. Cut in half and serve immediately with the chipotle mayo and pickled jalapenos on standby to add to future bites if needed. Swiss cheese is commonly used for traditional Cuban sandwiches, but there is lots of leeway on choice of cheese. I'm not a fan of Swiss cheese so I used Provolone. The measurements listed for the chipotle mayo will make enough for 3-4 sandwiches. Store leftovers in an airtight container in the fridge. Sweet ham is traditionally used in Cuban sandwiches. If available, try to use sweet ham slices but it's not a dealbreaker, regular ham will work fine too. If using a traditional sandwich roll you can always tear out inside portions of the bread to make the sandwiches flatter and less 'bready'. Want to read our latest recipe? 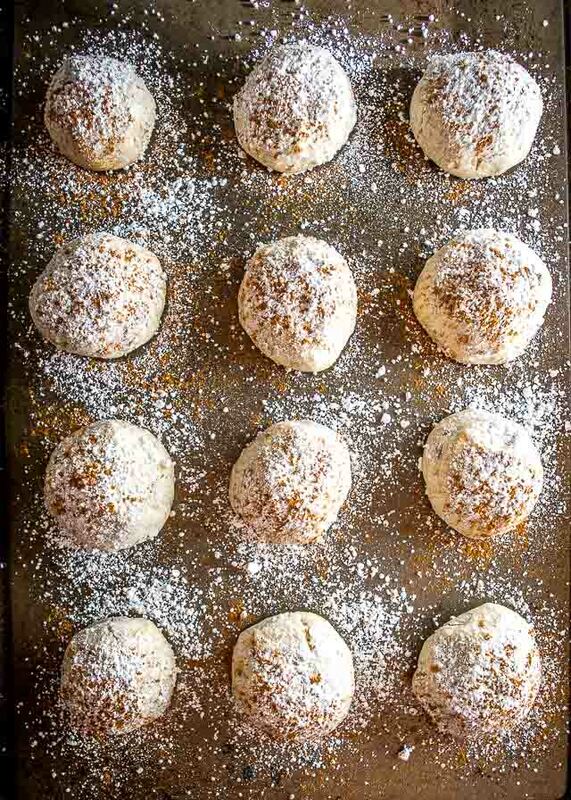 It’s these Mexican Wedding Cookies. Can’t wait to try this recipe. One can only eat so many carnitas tacos (blasphemy, I know), so this will be a great way to use the leftovers. I love traditional Cubanos, as well as grilled cheese sandwiches, but don’t own a panini press. A trick I learned was to wrap a brick in heavy-duty foil & use it as the press. Works like a charm!